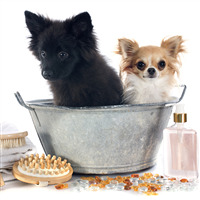 Our Pet Shampoo and Pampering Pet Spray are considered to be some of the best on the market. Pet gifts are popular and these bases will let you produce handmade products sure to please your customers!! Sulfate Free & Paraben Free Pet Shampoo. This shampoo base is gentle on pets and contains Tea Tree Oil and Rosemary Oil, which are thought to be great for skin and fur! Our pet spritz is a wonderful way to pamper your pet while keeping them smelling fresh and clean between baths. Made in the USA. Finally a pet shampoo that is gentle enough to use on pets of all ages. Contains ingredients derived from coconut oil.